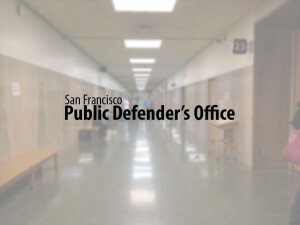 A person of color who was prosecuted after he was barred entry to his own apartment building by a security guard that didn’t believe that he lived there has been acquitted of all charges, Public Defender Jeff Adachi announced today. Shaun Huddleston, 52, was facing up to two and half years in jail for battery and resisting arrest after a confrontation with a guard at his building. Mr. Huddleston acquired a subsidized unit in a $5,000 a month complex on the 800 block of Brannon Street through a housing lottery. “As we see far too many times in this country, my client was a black man who just wanted to get home but was unfairly profiled by people who didn’t think he looked like he belonged there,” said Deputy Public Defender Brandon Banks. The incident began on November 24, 2018, when Mr. Huddleston attempted to enter the building without his key fob, the jury learned. He banged on the glass to get someone’s attention, but instead attracted the attention of a security guard who refused to let him in. “She never asked him to identify himself nor checked to see if he was in fact a resident,” said Banks. Mr. Huddleston testified that he became agitated, and cellphone and surveillance footage showed the animated interaction between he and the guard. At one point Mr. Huddleston attempted to pull the door open and the guard slammed his hand in the door, the jury learned. The defendant pushed the door back open, bumping the guard, which resulted in a battery charge. Initially, Mr. Huddleston was charged with three counts of making criminal threats after he became irate at the situation, but those charges were dismissed by Judge Kay Tsenin mid-trial, Banks said.